Gibson restrains an infuriated Ross; Fairchild waits. Ross took a 0-2 fastball from Rockies pitcher Edgmer Escalona for a called third strike and appeared to toss both his bat and helmet following the strikeout. Replays indicate the pitch was located over the outer edge of home plate and belt high (px .707, pz 2.984), the call was correct. At the time of the ejection, the Rockies were leading, 4-0. The Rockies ultimately won the contest, 4-3. These are Chad Fairchild (75)'s 1st and 2nd ejections of 2013. 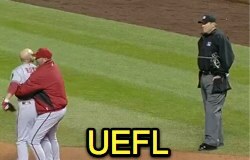 Chad Fairchild now has 8 points in the UEFL Standings (0 + 2*[2 MLB + 2 Correct Call] = 8). Crew Chief Jeff Kellogg now has 2 points in the UEFL's Crew Division (0 + 2*[Correct] = 2). These are the 12th and 13th ejections of the 2013 MLB season. This is the 9th player ejection of 2013. This is the 4th Manager ejection of 2013. Prior to his ejection, Ross was 0-3 in the contest including a pop out, lineout and strikeout. These are ARI's 2nd and 3rd ejections of 2013, T-1st in the NL West (ARI, LAD 3; SD 1; COL, SF 0). This is Cody Ross' 1st ejection since September 12, 2012 (Alfonso Marquez; QOC = Y). This is Kirk Gibson's 1st ejection since June 5, 2011 (Rob Drake; QOC = U). This is Chad Fairchild's 1st ejection since July 30, 2012 (Devin Mesoraco; QOC = Y). This is Chad Fairchild's 1st ejection outright since Spring Training March 24 (Russell Martin; QOC = U). I might be in the minority but I do not think Ross deserved to be tossed here. Yes he threw the bat farther than he needed to but it looks like he was mad at himself. He doesn't say a word to Chad until after he gets ejected. An equipment fine would have been more appropriate. However, Ross acted like a maniac after the ejection. Good job by Gibson to keep him away from Fairchild. Jeff Kellogg needed to be there a lot sooner IMO. Ha. Cody Ross lost his mind. It reminds me of a Manny Ramirez ejection several years back when he was with the Dodgers. It was a strikeout looking call to end the half inning, Manny walks out towards the mound like hitters tend to do after making the third out, tosses away his bat and helmet and I think that protective elbow pad he used to wear and he got thrown out of the game. Coincidentally, I think it was at Chase Field in Arizona, too. September 7, 2009, Ejections: Doug Eddings (4) [during the cascreamindude at livejournal days]. Manny Ramirez had taken the first two pitches from D-Backs P Max Scherzer for called strikes before swinging and missing at pitch #3, resulting in the third out to end the top of the 3rd inning. Ramirez threw several pieces of equipment, though he also maintained a conversation with Eddings regarding pitch location. The elbow guard, however, stayed on. You are possibly referencing July 7, 2009's Ejections: John Hirschbeck (1), during which Ramirez was called out looking to end the top of the 5th inning while the Dodgers were visiting the Mets in New York. During that sequence, Ramirez tossed bat and helmet aside as he strolled towards the mound and then flipped the elbow pad over his shoulder, which was in the physical direction of Hirschbeck. It was after the flip that Hirschbeck threw Manny out of the game. No-brainer. You can't launch your bat into Kansas and expect not to be tossed. Wow those were the days... what memories!! Yes! That was it, New York. Wow Manny got tossed twice for the same thing that year. Great stats find. you're not in the minority with me.... That was a very well worded opinion! Being ejected for throwing equipment, even out of frustration of yourself, is a perfect reason for being tossed. It's dangerous and shouldn't be tolerated. When Ross threw the bat, he was not looking in the direction that he threw it; therefore, he had no idea where it was going to land or if it was going to hit someone. Also, an equipment fine is not a deterrent, it's pocket change to most of these guys; being taken out of a game when they act like a child will work better to ensure they grow up. It might just be me but I feel like if a player throws his bat and helmet, he gets tossed every time. Some examples include Bob Davidson's ejection of Chris Dickerson in 2010, Bruce Froemming's ejection of Coco Crisp in 2007, Bill Miller's ejection of Brett Lawrie last season, and of course tonight. Gibson spit in Fairchild's face right at the end of the video. Man that would piss me off. Then the fine needs to be big enough to be a deterrent...this did NOT warrant an ejection. When he tosses the bat away from home plate, and then pitches the helmet toward the dugout, that's a sign to me that he's directing his frustration AWAY from home plate, and the only constant at home plate (which is the umpire). Thinking as an ump, this is exactly what I want a player to do when he's frustrated with himself. If your beef is with you, because you missed a fat pitch up in the zone, and you want me to know it, and you feel the need to toss your equipment, then toss it back to the dugout so it can get picked up and you can get back out on the field. Russ is right too...he didn't say a word to Fairchild until he'd already been run. you see players get called out on strikes for the third out and they'll just put their bat, helmet, gloves, etc. on top of the plate. i've seen them flip the bat toward their dugout and then head out to their position. i'm not really a fan of this ejection by any means. it looked like he just kind of flipped his bat and was heading to his position. The way he threw his bat speaks volumes - it was not a flip along the ground - it was a high arcing lob. I have seen enough bal players show up umpires while trying to make it look "accidental" to know - it is no accident. In fact, the way he walked away from the plate and the fact he has absolutely NO reaction until after the ejection makes me think his flipping of the bat was his attempt to intetnionally show up the umpire and to make the umpire look bad when he ejects the player. I went looking to see who/where someone noted this was an incorrect call. It might be the opinion that Ross was mad at himself instead of expressing toward the umpire. I think the bat toss is an absolute no brainer and it should come with a hefty fine. He tossed it over his head, where he couldn't see what he was doing or where it would go. he could have hit a ball boy coming out to do his job! More importantly, he's teaching kids that it's OK to do these things. I'm sure some will want to argue that the ballplayer isn't hired to be a role model, but if you are of that mindset than tell me why we pay people to play games in front of an audience. If it's going to land you in jail on the street, it should at least get you the hook during the game. NOW...if somebody can tell me why managers have to "defend" their players all the time without using the words "tradition" or "having his back", I'd like to understand that as well. For what these guys make, the need to be mature; no excuses or head cases, or attitudes--it's just too bad if they can't grow up. There are a 100 others who want their job and I'll be the majority of them are not head cases! People use the phrase "defending his player" mainly for managers who are trying to play rodeo clown to prevent a player from doing something stupid and getting suspended. You regularly see a manager literally running across a field to insert himself between a player and an umpire, and waving his hands and hollering to get the umpire's attention, especially if there's an ongoing argument between the umpire and the player. It's not based in tradition. It's based entirely in being able to write that player's name on tomorrow's lineup card.